Of the many surprising documents in the UNWCC’s archive, one of the most striking would be the indictment for Adolf Hitler. 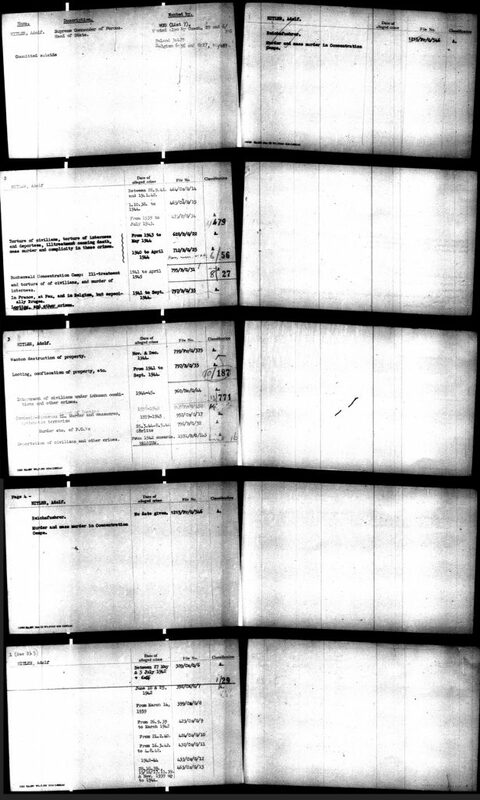 The five pages of indices for charges against Hitler. 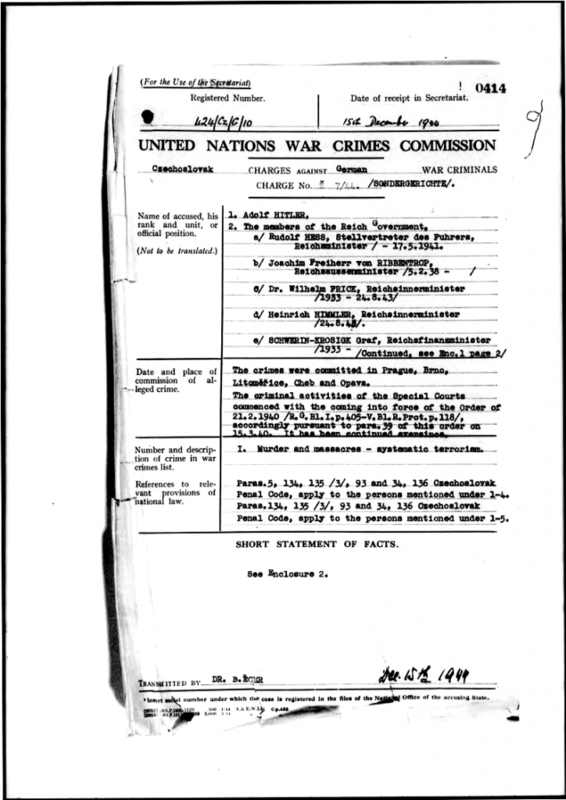 Most of this is self-explanatory; the ‘File No.’ refers to the UNWCC’s own charge number, then an abbreviation for the accusing country, then an abbreviation for the defendant’s country, then that country’s charge number. Click for more detail! As might be expected, Hitler was listed as a defendant for a great many Nazi crimes – most accused war criminals only have one or two entries – but it’s striking that Hitler’s actions were addressed in the same regularised legal system. Let’s take a closer look at one (or at least, its front page). The front page for just one of the many charges against Hitler, this one levelled by noted Czech jurist Bohuslav Ecer in December 1944. Click for more detail! Like with the index above, a few thinks are striking about this page. It is an extremely ambitious case – addressing several leading Nazis, for a wide range of crimes – but it is also a very ‘normal’ one by the standards of the UNWCC. Hitler’s crimes – great as they were – were recognised to be prosecutable within the framework of complementary international/domestic law, even while the war in Europe was still raging. NextHuman Rights After Hitler – in the news!